January 10, 1982. It’s a cold Sunday afternoon in the San Francisco Bay, in which the overcast sky has somehow foreshadowed the gloom of a game which has not turned out as expected. The San Francisco 49ers have struggled all day, losing three turnovers to their hated rivals, the Dallas Cowboys and are trailing 21-27 in the fourth quarter with mere seconds remaining on the clock. Fans scream out in desperation and fatigue as they try to somehow extend their hard-fought season. It’s 3rd and 3 on the Cowboys’ 6 yard line and seconds continue to tick away. The Niners had somehow driven down the entirety of the field in less than three minutes, and the end seems closer than ever as the Cowboys’ tenacious defense continues to evade blockers and thoroughly punish receivers. 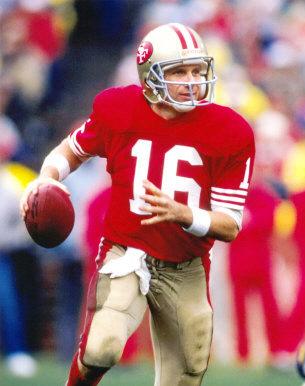 Joe Montana is the young, rising star for the 49ers. He was drafted three years ago but hasn’t yet established himself as a leader on the team. In the huddle, he looks to Pro Bowl wide receiver, Dwight Clark with a nod, then calls the play. “Red Right Tight, Sprint Right Option,” he states calmly yet confidently to his exhausted teammates. As they leave the huddle, tired and searching for the energy to finish the game, they approach the line of scrimmage hoping that somewhere in that eccentric brain of his, Joe Montana would make the play. The crowd goes silent. Montana walks up to the line and looks around as if to analyze the defense. He quickly snaps the ball and drops back three steps. He’s already thrown three interceptions on the day and the momentum was leading toward a fourth. Montana scrambles to his right moving as fast as he can, trying to overcome his fatigue and desperation as his feet somehow run with a tenacity he’d lacked all game long. He scans the field and weighs his options. Throw to the trusty wideout, Freddie Solomon? He’d had a nice game already and was waiting for his chance to be a hero. Not today. He was covered closely by star safety Charlie Waters. Perhaps the reliable running back, Lenvil Elliot? Not even close to open. As Montana approached the sideline, he was running out of room quickly. Finally, he spotted his chance. Receiver, Dwight Clark had been hot all day and was currently breaking away from Everson Walls, the Cowboys’ star cornerback in the back corner of the end zone. Montana can see three Cowboys linemen running at him. Ed “Too Tall” Jones and Larry Bethea, plus linebacker D. D. Lewis had already broken their tackles as they sprinted toward Montana, yelling, screaming and jumping, trying to do anything to disrupt his focus. He pump fakes once. Nothing. He pump fakes again as the sideline is mere feet away. He catches the three linemen as they each jump into the air, giving Montana just enough room to make a real throw. He launches a pass into the back corner of the end zone as two of the lineman knock him to the muddy ground. Time stops. Silence. Not only in the air at the 49ers’ new home of Candlestick Park, but throughout the country as people lean closer to their TV sets. 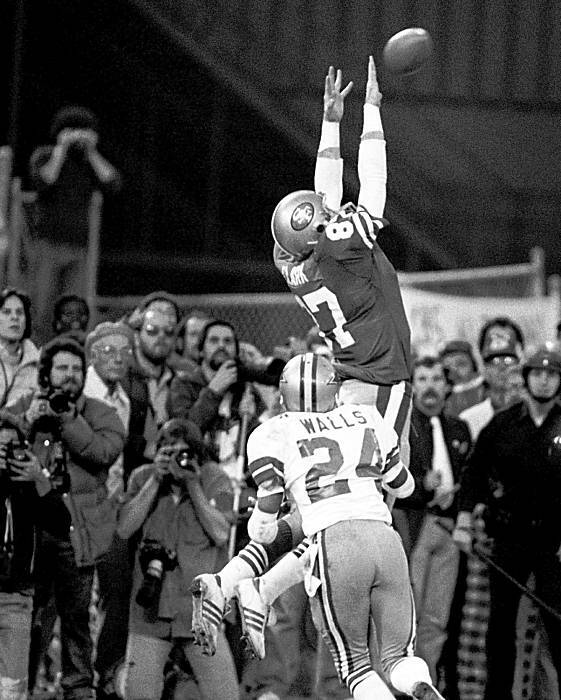 Two taped, gloveless hands, unfit for a receiver, reach up seemingly out of nowhere and stop the screaming football’s momentum as a flying Dwight Clark pulls the ball into his arms, landing in the back of the end zone. Joe Montana looks up from the grass, through players and cleats. As he sees Clark’s two feet hit the ground, he already knew he’d caught the ball. Ed “Too Tall” Jones stands above Montana, looking defeated and says to Joe under his breath, “Looks like you just beat America’s team.” And begins to walk off the field. This entry was posted in Sports and tagged 49ers, Bay Area, San Francisco 49ers, Sports, Writing. Other than that… good story. Hope it helps you enjoy another NFL Playoffs/Super Bowl without the Niners. LoL, damn…you’re totally right. Well, kinda like Bay Area sports in general the last 15 years, the made up stories usually are a lot better than reality anyway…good call, Chuck. Loooove that pic. I found some really good pix actually just by googling “the catch montana clark”. Gooood stuff! Glad you enjoyed it.